Hello blogging friends! I hope you are all having a wonderful weekend. Today, I have another jewelry piece to share with you. 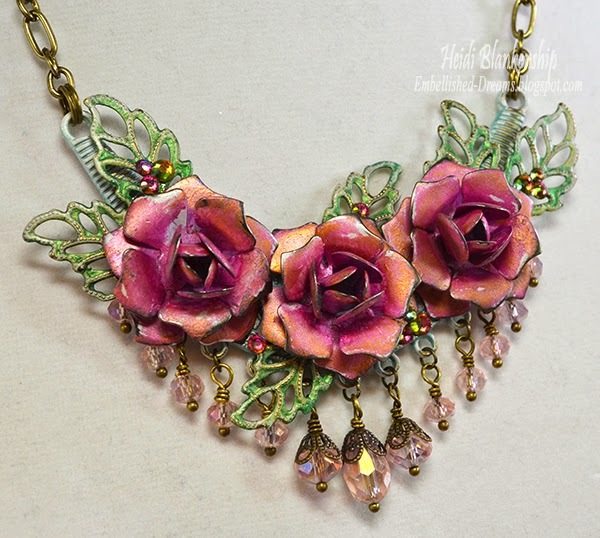 I used several bits and pieces from ButterBeeScraps to design this necklace. 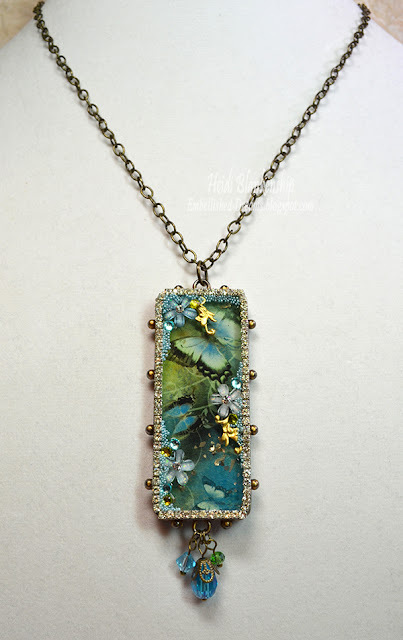 I added a beautiful image from ArtCult on Etsy to the Mixed Metal Hobnail Long Rectangle Bezel, Antique Silver and then I filled it with ICE Resin. After I poured the resin I added some German glass glitter. 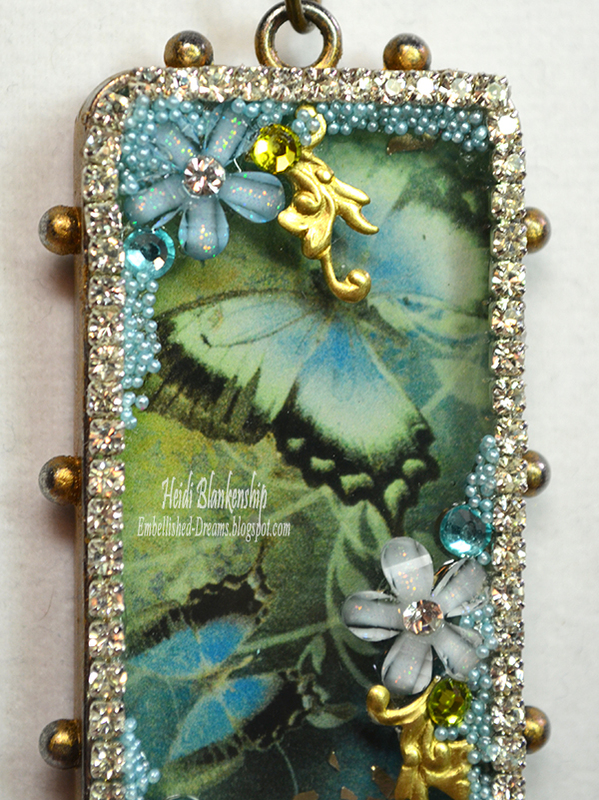 After the ICE Resin was set then I added some SS8 Crystal Rhinestone Chain Trim around the outer edge of the bezel. 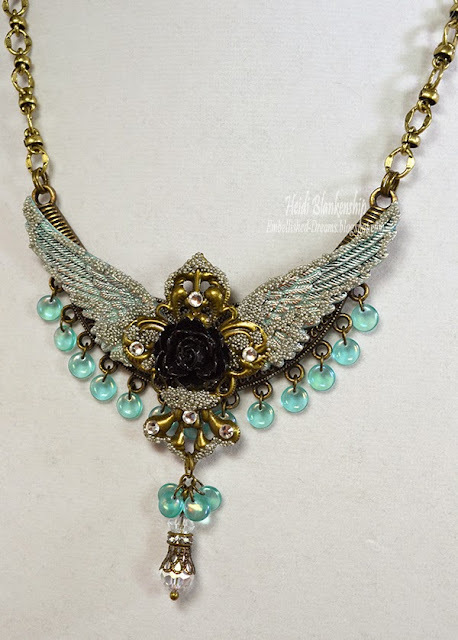 Next I added some Blue Resin Flower with Rhinestone Center, Blue Micro Beads, some pieces from the Brass Filigree Embellishment (Item #006-G), SS12 Olivine Flat Back Glass Rhinestones, and SS12 Aquamarine Flat Back Glass Rhinestones. 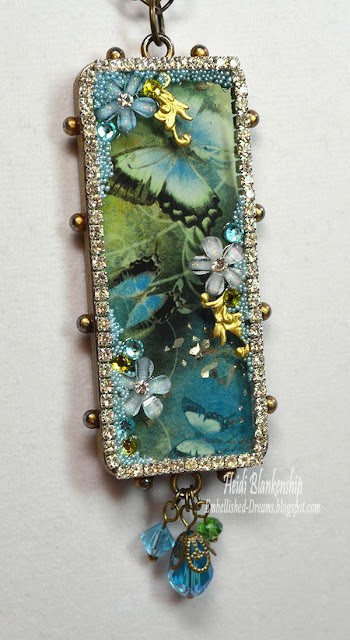 The rhinestones and resin flowers match the image in the bezel perfectly. I also created some beaded dangles using some of my own beads and Bronze Filigree Bead Cap CAP114-B, and Bronze Ball End Head Pins. Here is a close up of the bezel. I also used a little gold Rub-N-Buff on the bezel to being in some of the gold tones from the brass filigree pieces and then I sealed the bezel. Hello everyone! Today, is my day to post for The Stamp Simply Ribbon Store and I have a Father's Day card to share with you. I think this is one of the quickest cards I have ever made but the paper is so easy to work with and cards come together so quickly. 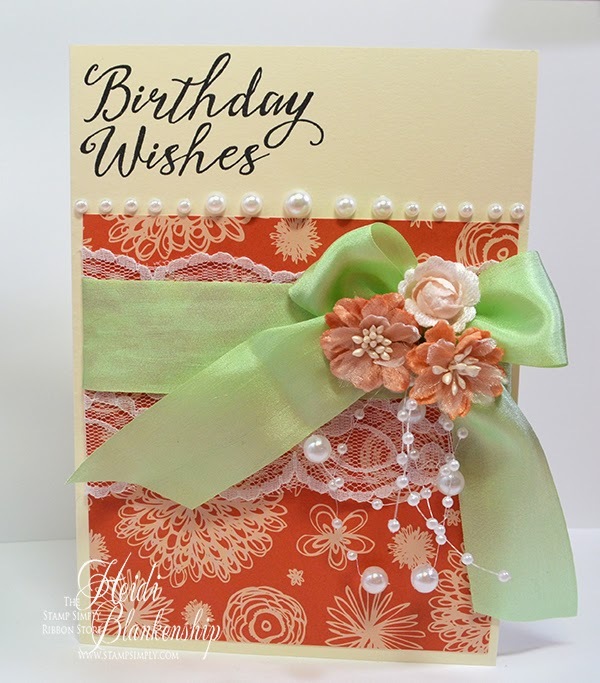 Here is the card that I designed using the Ken Oliver Crafts 6 x 6 The Studio pattern papers. I love this collection--fantastic images and colors! I used kraft cardstock for the card base and as a mat and I inked both pieces on the outside edges with Memento Espresso Truffle ink. My card is 5.5 x 5.5 so I trimmed down the background paper to fit. Then I took a smaller image and stamped a sentiment from JustRite Papercraft CR-02166 Stacking Sentiments Clear Stamps. Here you can see a close up of the sentiment. I added 3D Foam Squares for a little dimension. Then to finish the card off I added May Arts 1.25" Woven Stripes Ivory/Olive Green ribbon. I frayed the edges of the ribbon just a bit to give it a distressed look. Father's day is just around the corner so if you need to make some cards I hope you will check out the Ken Oliver Crafts 6 x 6 The Studio papers. Happy Friday and I hope you have a wonderful weekend! Hello blogging friends! A couple of weeks back I mentioned I would be having another Craft/Stamping/Scrapbooking Supply Sale. The dates have been set and I have been busy getting everything ready. If you are local to Southern MN and Northern Iowa and you love crafting, stamping and scrapbooking you won't want to miss this sale! Spellbinders, Cricut, We R Memory Keepers, Fiskars, JustRite Papercraft, Crafty Secrets, May Arts Ribbon, Graphic 45, My Mind’s Eye, Want 2 Scrap, Tattered Angels, Flower Soft, and DCWV… Products from several manufactures including--manual and electronic die cutting machines, dies, stamps, paper, ribbon, bling and lots of embellishments. please email me for my address if you don't already have it. I go through my supplies every year so I can make room for the new products and I have lots of papercrafting supplies from top name brand companies. This is a quick reminder there is still time to sign up for the stamping class I will be teaching this Thursday (5/ 28/15) at the Albert Lea Senior Center. If you are local and interested here is the information for the class. Please feel free to share this with your crafty friends. 6:45 pm in the Craft Room. You must register for the class--please call the number below. and learn some new fun techniques. 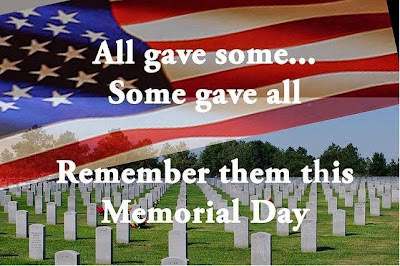 Let us remember all who have served and all who are serving now and their many scarifies. A special Thank You to all service men and women and their families. 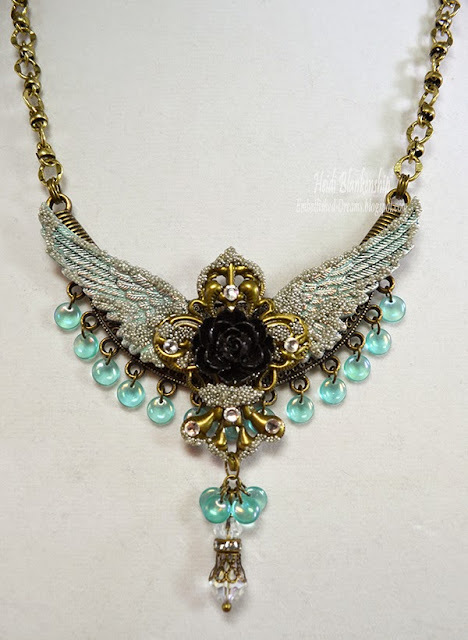 Here is a look at the first necklace I designed. 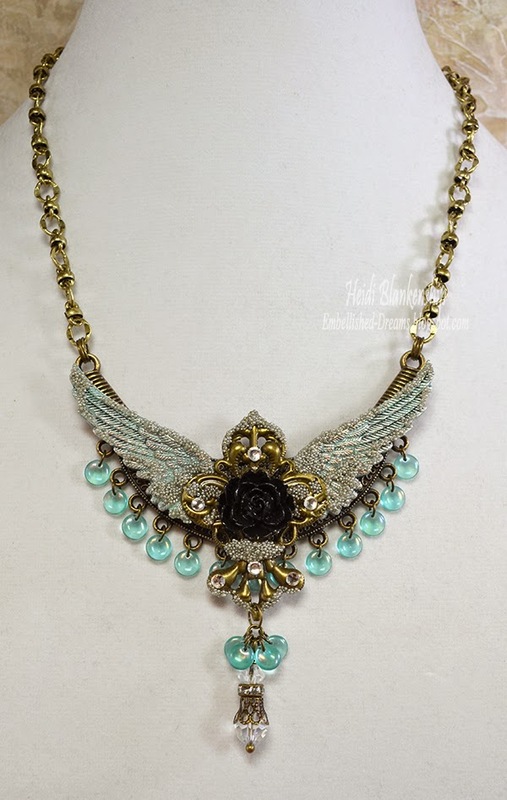 Fleur de lis & Patina Wings Assemblage Necklace. I used the Bronze Necklace Base J368-B and then added the Antique Silver Wing Charms (Item #J327-S) and Bronze Fleur de lis. 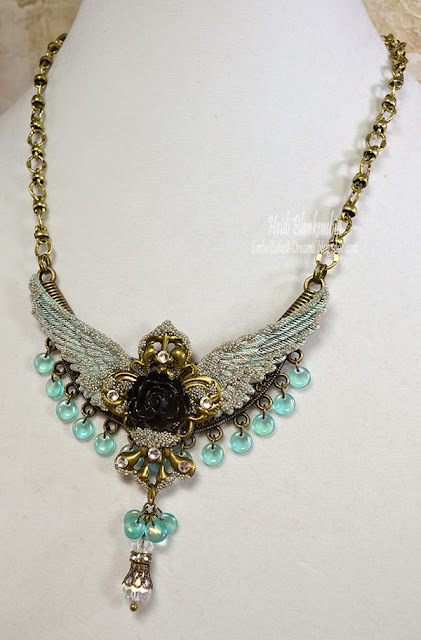 I used Patina Rub-N-Buff on the wings and then I added silver micro beads to the wings and fluer de lis. 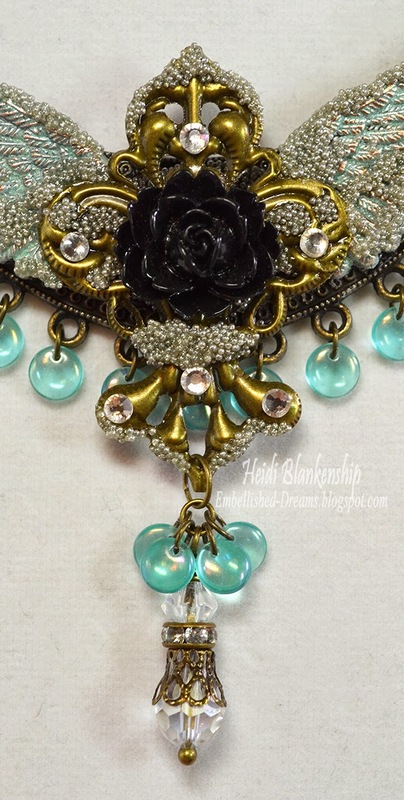 I added a black rose Resin Flower Embellishments (Item #RES606-BK) to the center of the fluer de lis and then I added a few SS12 Clear Flat Back Glass Rhinestones for a little bit of sparkle. Here is a close up of the fluer de lis. I added some small flat round aqua beads and a beaded dangle. To make the beaded dangle I used a Bronze Ball End Head Pins, Bead Caps CAP114-B, Clear Rhinestone Rondelle Spacer Beads - 6mm (Item #BD006-B/CL), 8x12mm Faceted Glass Teardrop Beads - Clear AB, and 6x8mm Faceted Glass Abacus Beads - Clear AB. 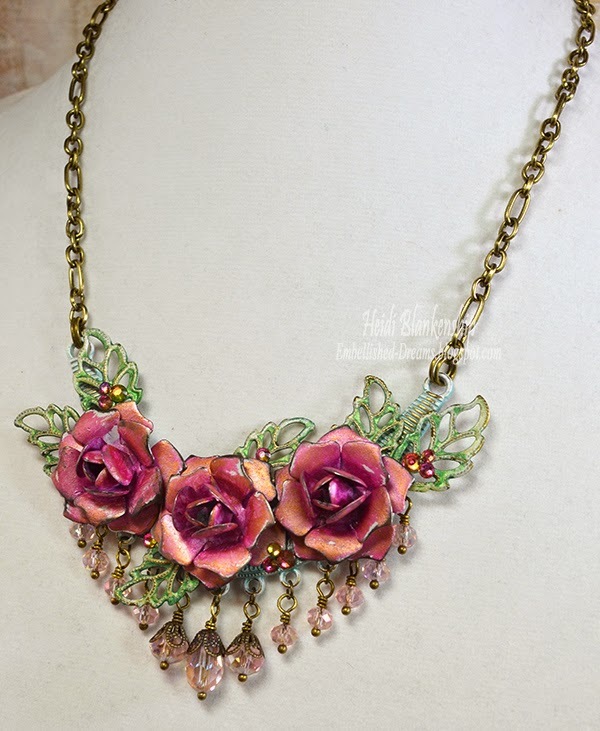 This necklace is definitely a statement piece! Here is the second necklace I designed and I think this one might be my favorite. 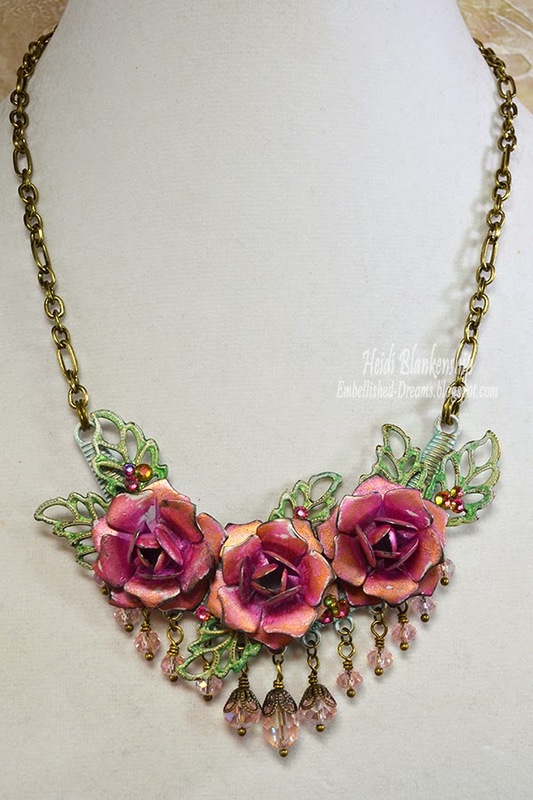 :) Golden Magenta Rose Assemblage Necklace. On this necklace I used a few colors of Lumiere Paints and a flat white paint. I love how it looks! After the paint was dry I buffed all of the pieces with steel wool to give it more of a shabby look. 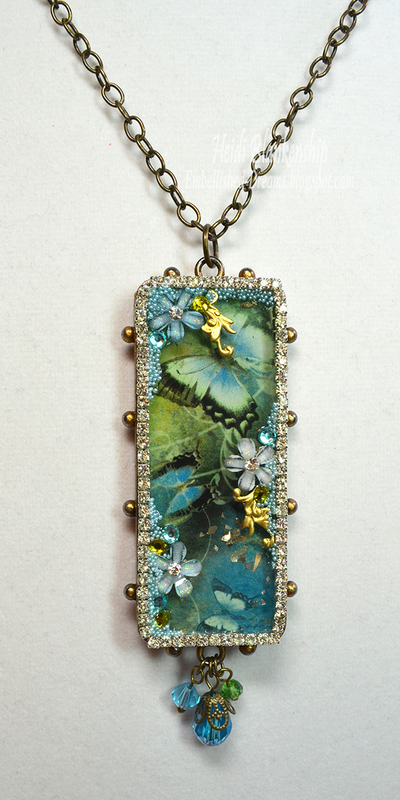 I used the same Bronze Necklace Base J368-B but I added some Pearl Turquoise Lumiere Paint. 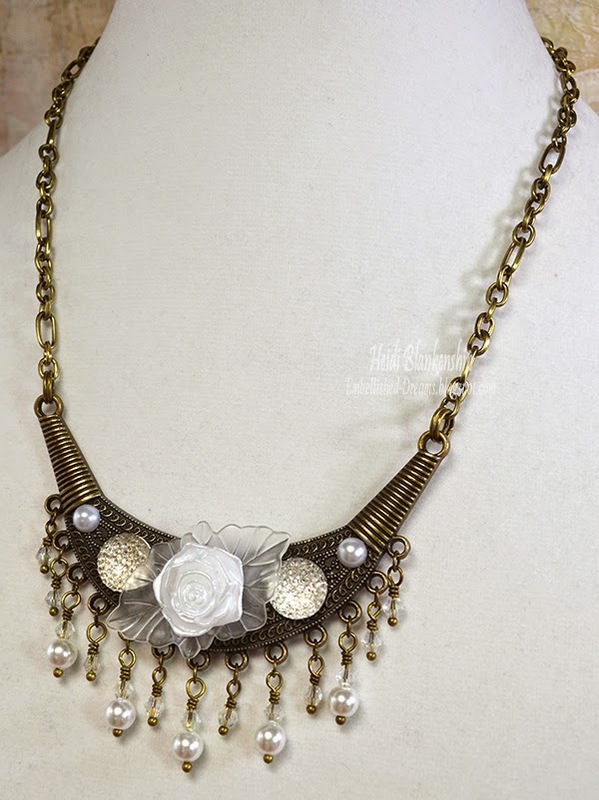 Then I added some Gun Metal Roses 7005-GM, Bronze Filigree Embellishment (Item #150-B) leaves. I used Pearl Magenta, Halo Pink Gold, and Pearl Emerald Lumiere Paints on the roses and leaves. Once the paint was dry I buffed them with steel wool. 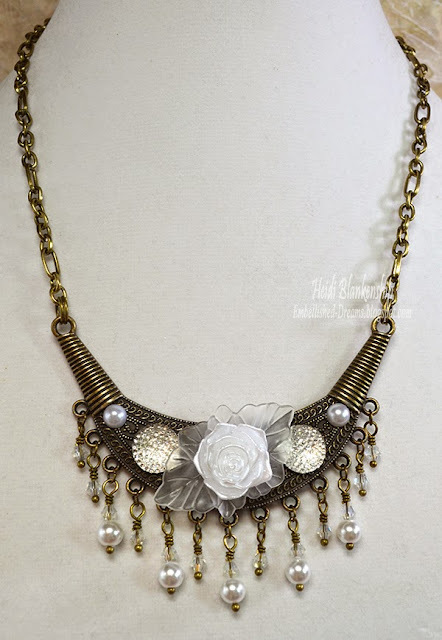 Then I added some Gun Metal Roses 7005-GM, Bronze Filigree Embellishment (Item #150-B) leaves. 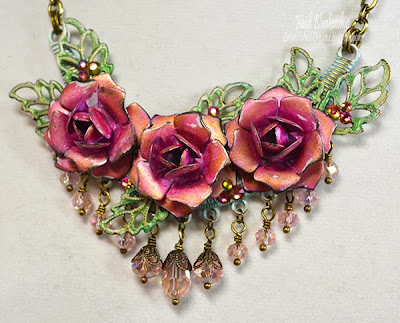 I used Pearl Magenta, Halo Pink Gold, and Pearl Emerald Lumiere Paints on the roses and leaves. Once the paint was dry I buffed them with steel wool. Then I used Bronze Ball End Head Pins, Bronze Filigree Bead Caps (Item #CAP052-B), and Sm Round, Lg Round, Teardrop--Rose Pink Crystal Beads to create the beaded dangles. Here is another close up. I love the look of the bronze and gun metal mixed metals and the pretty shabby colors of paint. For a little bit of sparkle I added some SS10 Vitrail AB Flat Back Glass Rhinestones, SS12 Vitrail AB Flat Back Glass Rhinestones, SS16 Vitrail AB Flat Back Glass Rhinestones. I have to tell you the color in these rhinestones is so gorgeous! They go from a pink, purple to a green and gold. Love them!! All of the necklaces are approximately 18 inches in length. 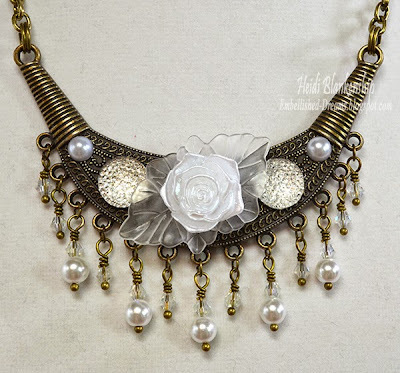 Here is the third necklace I designed Frosted Rose & Pearl Necklace. On this necklace you can see a lot more of the Bronze Necklace Base J368-B. The base is so pretty and has a lot of detail. For the focal point I added a pretty white pearl rose and some frosted leaves to the center of the necklace. Then I added RES823-CL sparkly bling and white pearls on each side. 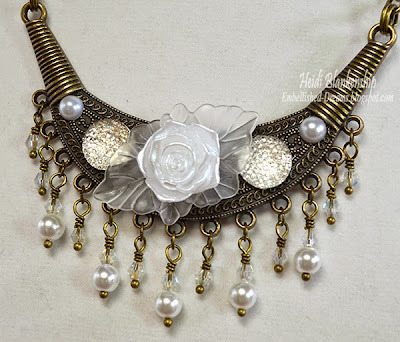 To create the beaded dangles I used Bronze Ball End Head Pins, Bicone Clear Crystal Beads, and White Pearls. I hope you enjoyed seeing these new necklaces. 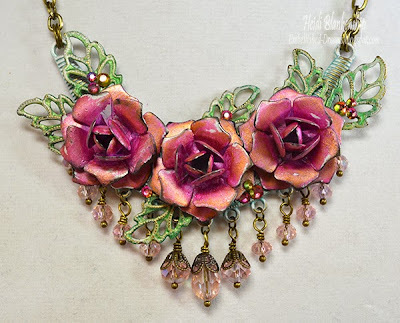 If you love to create jewelry or use metals in you artwork I hope you will hop on over to ButterBeeScraps and check it out! Also, if you are interested in purchasing any of these necklaces you can click HERE to visit my online store or you can click on each necklace listed below. Hello everyone! 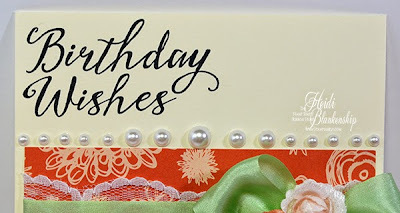 Today, is my day to post for The Stamp Simply Ribbon Store and I have a beautiful but quick and easy birthday wishes card to share with you. I started with a 5 x 7 ivory card base. I stamped the sentiment from CR-02172 Grand Handwritten Sentiments Clear Stamps from JustRite Papercraft using Memento Tuxedo Black ink. Here is a close up of the sentiment. 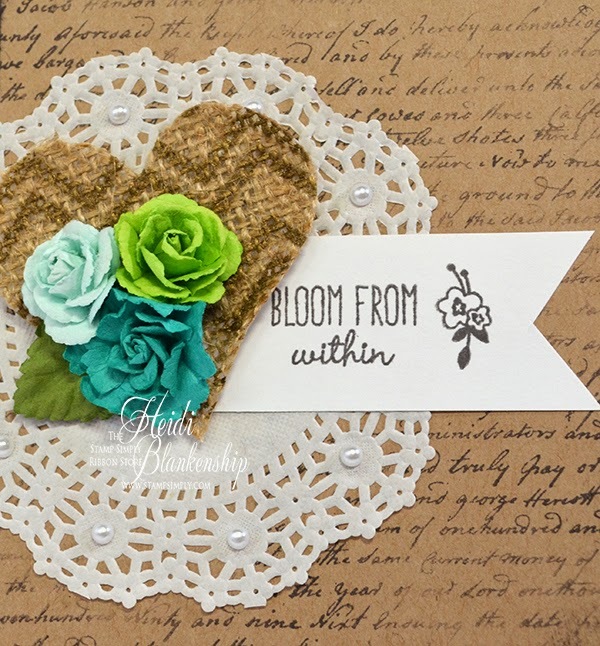 Next I added a pretty piece of floral pattern paper from the My Mind's Eye On Trend 6 x 6 Paper Pad. Then I simply embellished it with a layer of May Arts 3" Floral Lace with Scalloped Edge followed by a pretty bow made from May Arts Spring Silk Mint Green. Then I added some May Arts 3/8" Multi-Sized Beaded String-White for some fun movement on the card. I used Prima Miss Godivas Carmel Flowers to create the flower cluster. 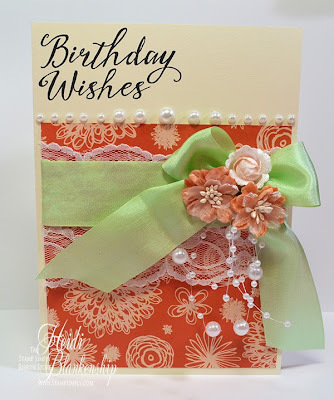 Then to finish off the card I added a row of Melissa Frances White Pearls across the top of the card. Hello everyone! Today, is my day to post for The Stamp Simply Ribbon Store and I have a fun little card with a few layers of embellishments to share with you. 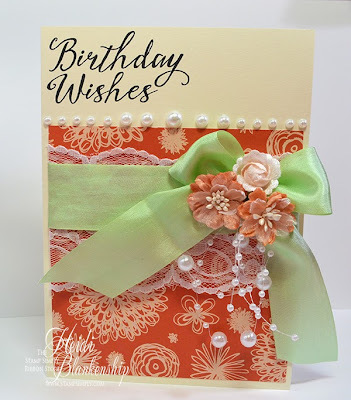 This card is very quick and easy to make. 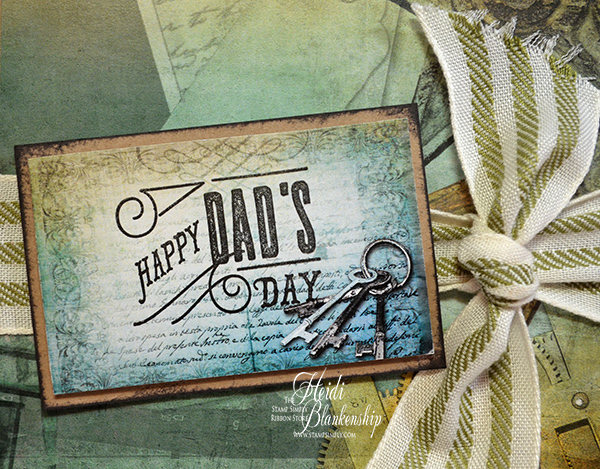 For the background I used CL-02157 Script Background Cling Stamp from JustRite Papercraft. I inked up the stamp with Memento Espresso Truffle and then I blotted off some of the ink ink random spots so it would be more faded and give the background and aged look. Then I inked the edges of the card base. To create the cluster and layers of fun embellishments I started with the Wilton Paper Doilies - 4" White Lace on the bottom. Then I cut a banner shape from white paper and stamped the sentiment and flower. I used the CR-02184 Choose Joy Clear Stamps from JustRite Papercraft. 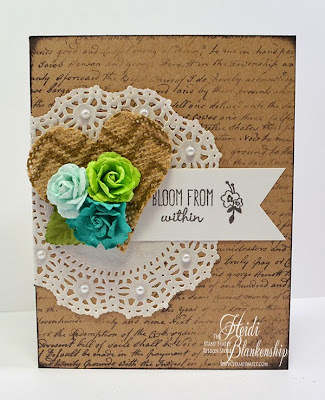 Then I used some May Arts 3" Printed Burlap - Gold Chevron and the SCD-025 Spellbinders Celebrations Die - Pierced Hearts to die cut the heart. Here is a little tip--I added packaging tape to the back of the ribbon and then burnished. Doing this will give a backing to the ribbon and it will be easier to die cut and also it will keep the burlap from fraying apart. I used 3D Foam Squares on the back of the heart to pop it up a little and add some dimension. Then I added some Prima Laraine - Blue Lagoon flowers. To finish off the card I added a few Melissa Frances Pearls - White. Hello blogging friends! 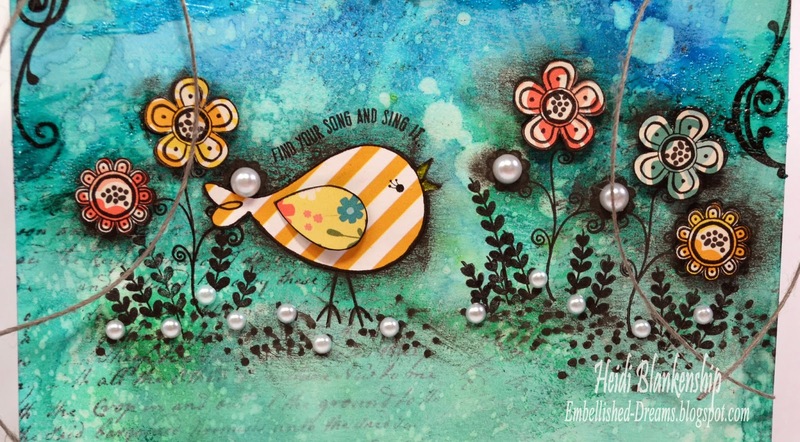 This is a quick reminder for some upcoming stamping classes. If you are local and interested here is the information for the classes. 1:45 pm in the Craft Room. You must register for the class. 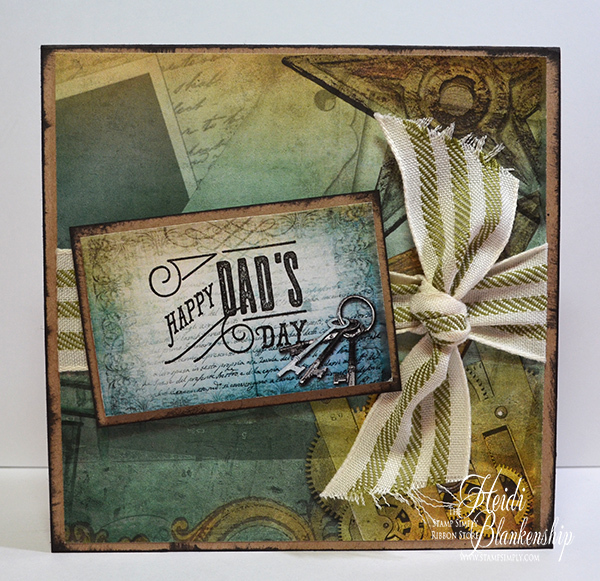 stamps, paper and die cut shapes. Hello everyone! It's time for Tutorial Tuesday with JustRite Papercraft and today I will be sharing with you how to use the MISTI Stamping Tool with Multi-Step Stamping. Multi-Step stamps. 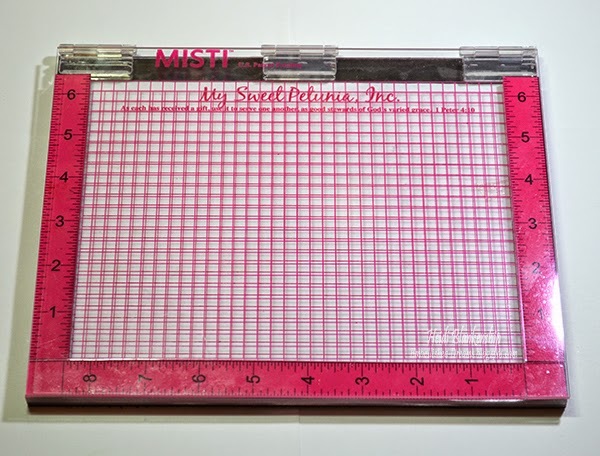 You can also use the MISTI with all clear and cling stamps. 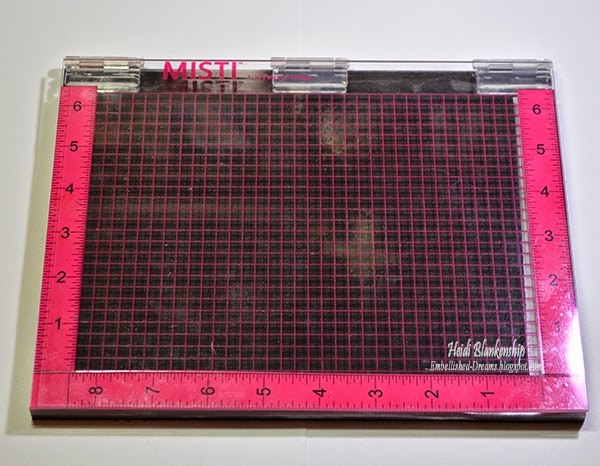 There is a piece of black foam inside the MISTI tool that you use when stamping with clear stamps. If you want to stamp using cling stamps simply remove the black foam. 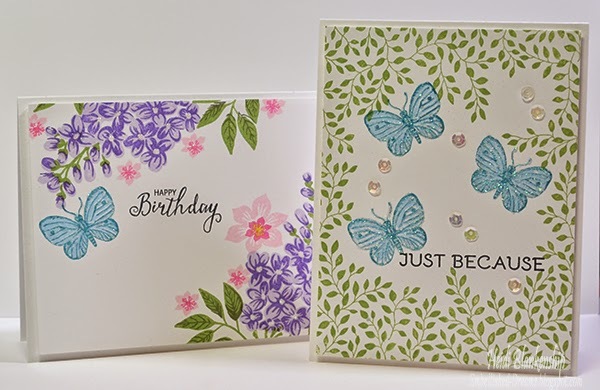 These are the two cards that I designed using the MISTI Stamping Tool, CR-02187 Multi-Step Lilac Bouquet and CL-02182 A2 Garden View Cling Background Stamp. The beautiful stamps are from the May 2015 stamp release from JustRite Papercraft. I also used CR-02141 Sentimental Damask Vintage Labels Eight Clear Stamps and CR-02152 Best Wishes Clear Stamps for the sentiments. 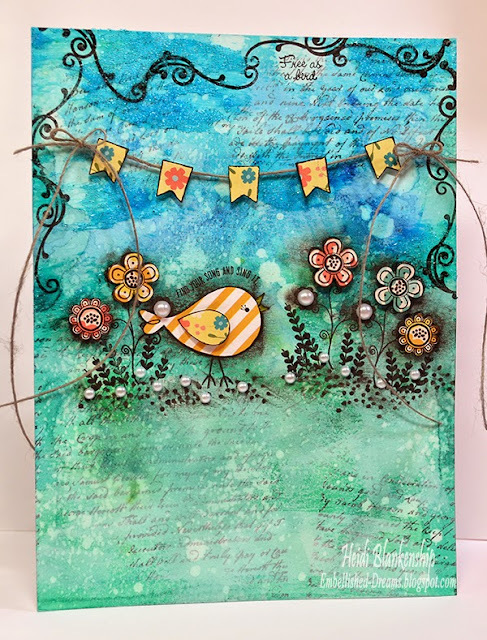 I have a step-by-step picture tutorial to share with you over on the JustRite Inspiration Blog and you can click HERE to visit the blog. I also have a video tutorial on YouTube on the JustRite Papercraft YouTube channel and you can click HERE to see the video. Don't forget to leave a comment on the JustRite Inspiration Blog and the Video for a chance to WIN a $25.00 Gift Certificate from JustRite Papercraft. Hello everyone! 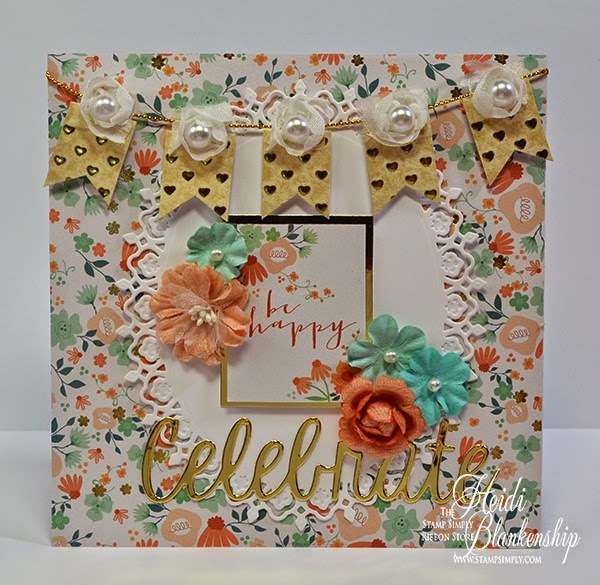 Today, is my day to post for The Stamp Simply Ribbon Store and I have a beautiful card to share with you that could be used for several different occasions. 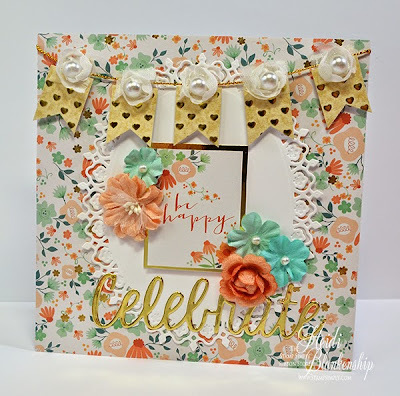 Be Happy and Celebrate--I think this card could be used for a birthday, wedding or anniversary and even a thinking of you card for a friend. There are lots of gold touches in this card. The beautiful floral pattern paper is from My Mind's Eye On Trend. 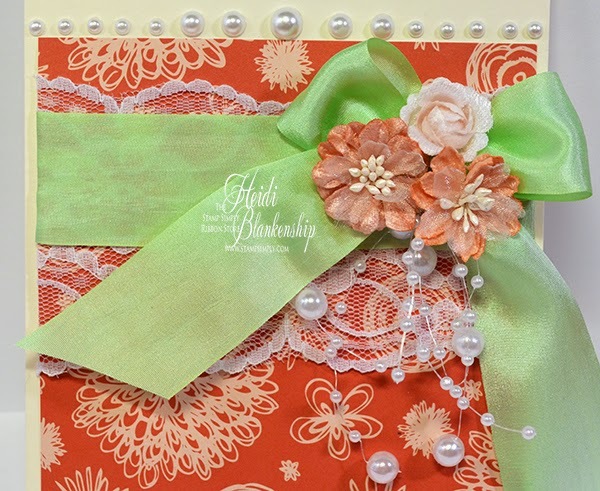 This paper pad has a wonderful mix of the mint green to aqua color and coral with touches of gold foil. As you can see this paper has some little gold flowers in the background. The Be Happy sentiment was fussy cut from the paper pad and then I added some Gold Mirror Cardstock behind it. 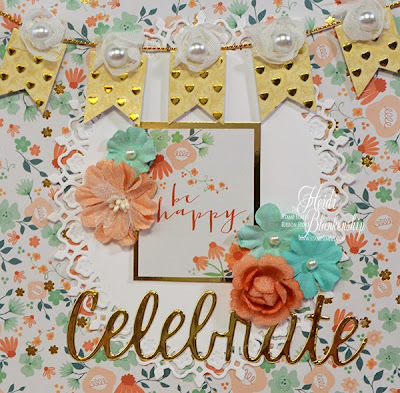 For the Celebrate sentiment I used SCD-029 Fun Sentiments dies and Gold Mirror Cardstock. 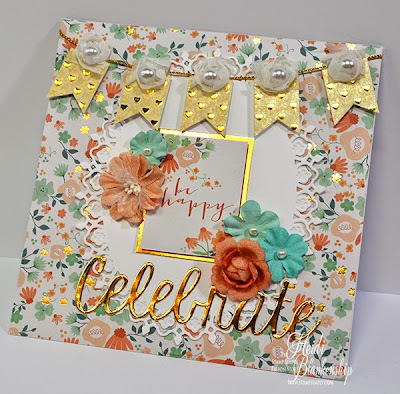 To create the little banner I used Little B Foil Tape - Gold Hearts and I put the tape on a piece of the Gold Mirror Cardstock and since the tape is kind of like a velum some of the gold shows through. I fussy cut all of the banner pieces and then I added May Arts 5/8" Adhesive Rosettes - White and gold metallic string. I put Melissa Frances White Pearls in the center of each of the rosette flowers. Here is a close up of the banner. I just thought this was a fun and different way to use the washi tape. I love how all of the gold just pops when the light hits it! I finished off the card by adding some Prima Miss Godivas Caramel and Prima Abbey (aqua/mint) flowers. Hello everyone! 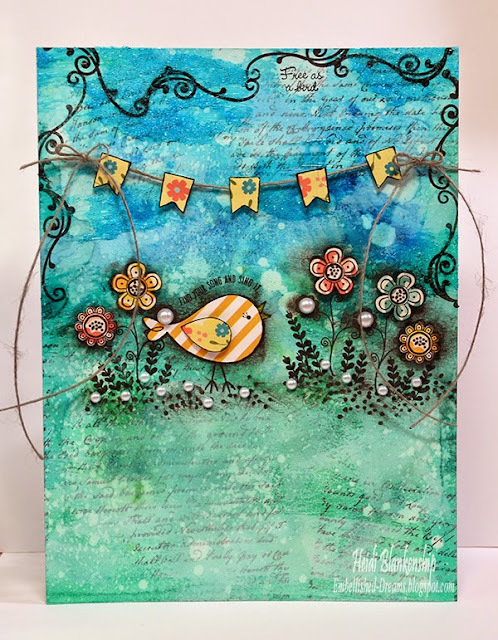 Today, is the third and finally day of the JustRite Papercraft May New Release and I have a fun mixed media canvas to share with you. How fun is this bright, bold and playful canvas? Now I will admit using the bright and bold colors for me is a little out of my comfort zone but what the heck--I just had fun with it. 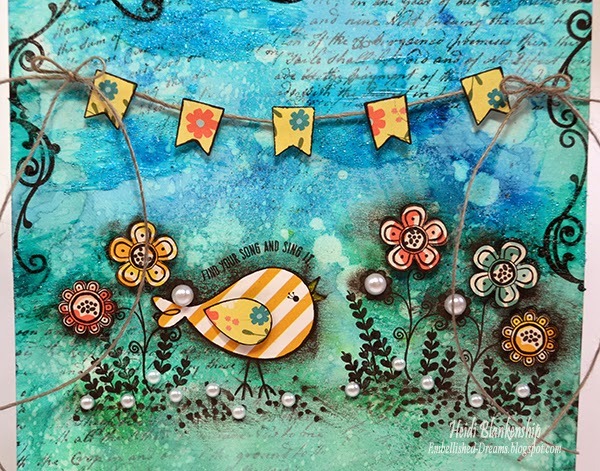 Check out the cute little birdie--love it!! I used the CL-02157 Script Background Cling Stamp kind of randomly in the background and for the main focal point I used the New CR-02183 Sing Out Loud Clear Stamps. Lots of fun layers with Ken Oliver Crafts-Color Burst , Stamping, Gesso, and paper piecing. I don't have a full tutorial for the canvas but I did snap a couple of pictures of the background from when I started working on it. I actually used a piece of Strathmore Mixed Media paper and then the finished piece was adhered to a hard canvas board. 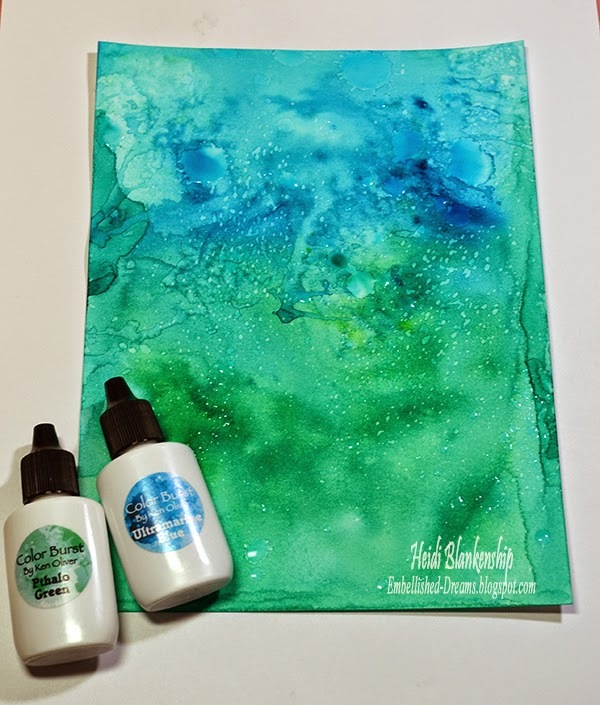 I misted the paper with water and then I sprinkled on some of the Pthalo Green and Ultramarine Blue Ken Oliver Crafts-Color Burst . I let the colors and the water kind of do their magic on their own. I misted a little more water and then just moved the paper around a little. Then I used a heat tool to dry the paper and set the colors. Next I misted more water on to the craft mat where there was still color burst and then I gently tapped the paper into the mix picking up more color. I did this a few times until I was happy with the look and then I heat set and dried the paper again. Doing this will add layers and depth to your paper. Next I did a combination of lightly misting the paper and also spraying some water in to my hands and letting it drop on the paper. I let the water sit on the paper for a minute or so and then I put a paper towel on top of the paper and blotted to remove the water. 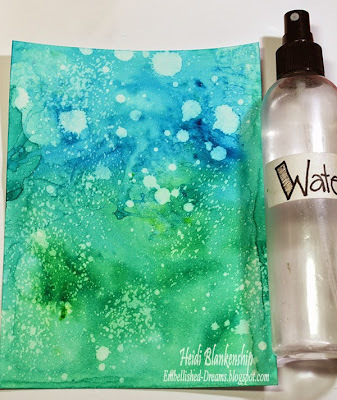 Doing this also removes some of the watercolor wherever the water was. It creates a fun textured look. Once I had all of the color added to the background then I sprayed a couple layers of Krylon Clear Satin Sealer on to the paper. Doing this will seal the colors so you can add layers of other paints, mediums or whatever you would like on top of the background without messing up the background. Next I used Stazon Jet Black ink and randomly stamped the CL-02157 Script Background Cling Stamp. When the ink was dry I dry brushed over most of the paper with white gesso. The gesso does help to tone the colors down just a bit and it covers up some of the script stamping in the background. Once the gesso was dry then I applied some Golden Glass Bead Gel. I mixed some of the Ultramarine Blue Color Burst in with the gel. You can see the beaded gel at the top of this picture (you can click to enlarge the picture for more detail). 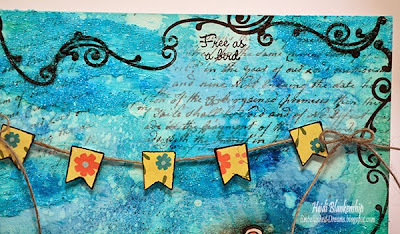 The gel does take a little time to dry so while I was waiting on that I stamped and fussy cut the little bird, wing, and flowers, For the banner I used a EK Success punch. Once the gel was dry then I started stamping on to the paper. I stamped all of the images using StazOn Jet Black ink. Then I wanted to add some shading so I went over the bird and flowers with a Spectrum Aqua Marker Black working in just small areas and then I rubbed and blended out the color with my finger. Once the shading was done then I added all of the paper piecing. 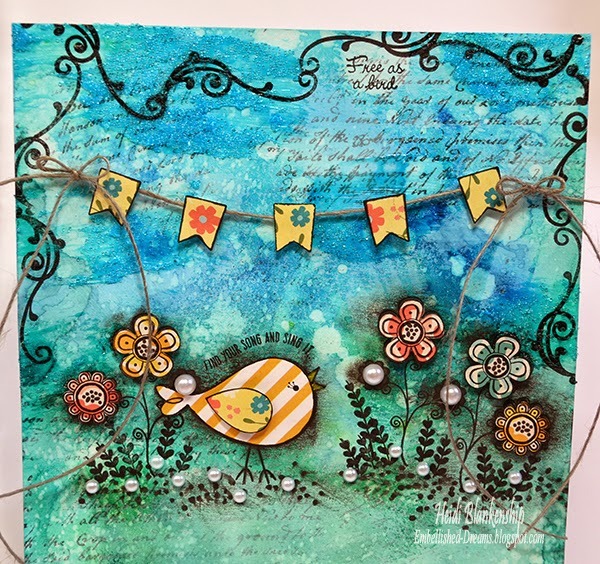 All of the pattern paper is from the Simple Stories I AM 6 x 6 Paper Pad Collection. I added 3D Foam Squares to all of the pattern paper pieces except for the body of the bird. To finish off the piece I added a few pearls. The Sing Out Loud Clear Stamps is perfect for mixed media, art journaling and card making. I had a lot of fun playing with the new set and creating the canvas. Please be sure to visit all of the Design Team Members in the link list below to see all of the fun projects they have created to share with you. 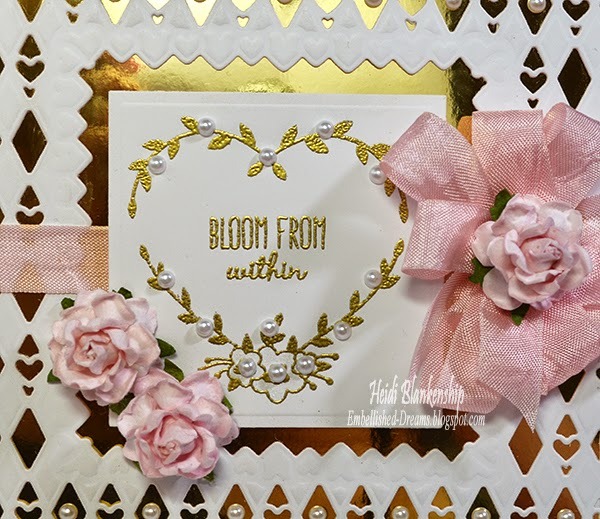 Bloom From Within Card - JustRite Papercraft May New Release Day Two! Hello blogging friends! It's day two of the JustRite Papercraft May New Release. I have to say I am loving this stamp set!! I love the dainty little vines and flowers along with the sweet sentiments. Gold foil and gold embossing is so on trend right now and I think it just adds a touch of elegance to any project. 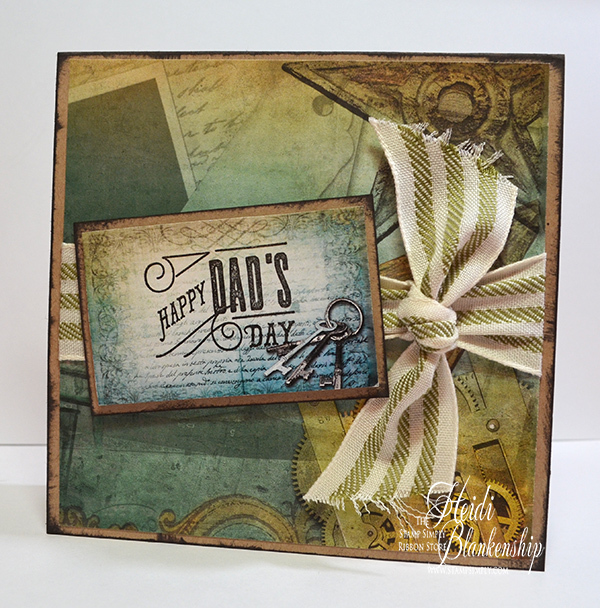 For the background on my card I used a gold foil cardstock and then layered it with a beautiful die cut. I wanted to keep this card simple but still have the wow factor and I love the white and gold combination. 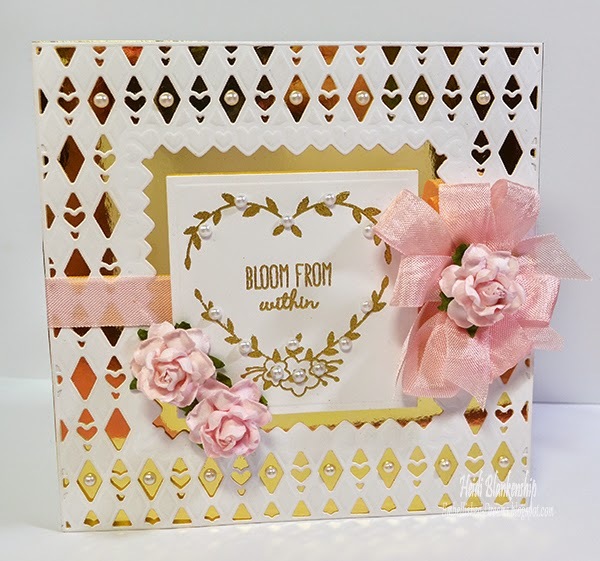 I used S6-025 6 x 6 Matting Basics A and S6-019 Lovin' Diamonds die templates from Spellbinders to create both of the die cuts. 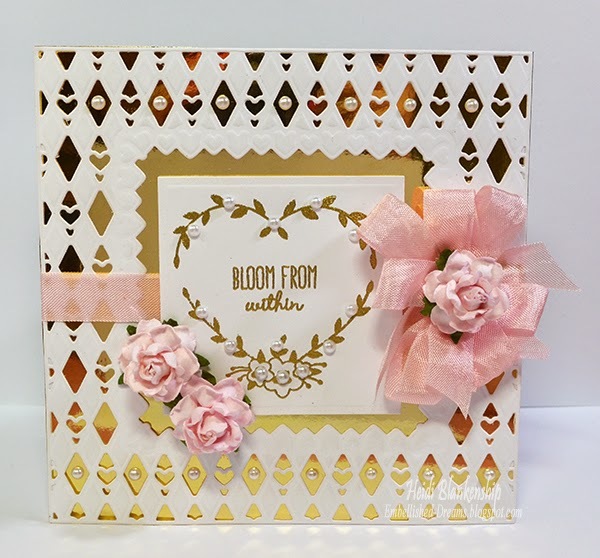 On the smaller square die cut I stamped the heart shaped wreath image along with one of the sentiments from CR-02184 Choose Joy Clear Stamps using VersaMark ink and then heat embossed with gold embossing powder. Here is a close up of the stamped image. I added a few white pearls around the wreath and in the diamonds at the top and bottom of the card. For the bow I used baby pink seam binding. I finished the card off by adding a few roses from Wild Orchid Craft Flowers. 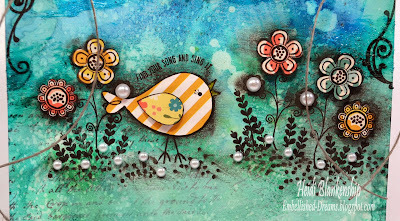 Please be sure to visit all of the Design Team Members in the link list below for more beautiful stamping inspiration.